With each update we continue on our mission to shape the world’s best user-centric browser. The latest version of Vivaldi is no exception and includes a number of new features that we can’t wait for you to try! Vivaldi users already enjoy a huge amount of flexibility in how they wrangle their tabs. Hopefully you’re well versed with Tab Stacks and Tab Tiling. With today’s update, we’re taking tab management to another level. You can now select multiple tabs, apply commands to them in bulk, and drag the selected tabs into stacks. You can even drag tabs between windows on your desktop. Check out the video below to see it in action. If you haven’t tried the notes function in Vivaldi, now is the time. Notes is a built-in tool that lets you capture your thoughts while you browse. 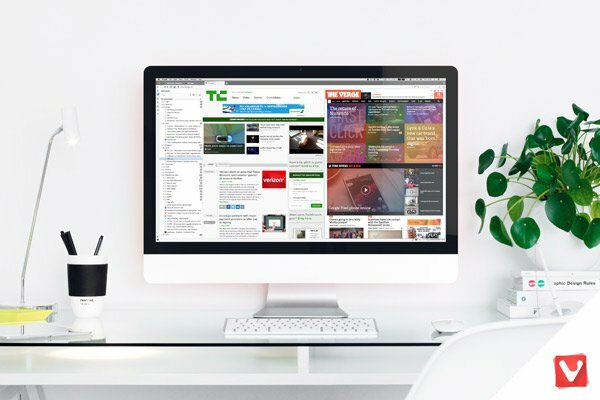 The tool lives in your browser side panel and is the perfect way to grab quotes, screenshots and make note of links without leaving Vivaldi. And now, you can automatically attach a screenshot of the page that inspired the note. Very handy. Along with performance improvements, accessibility of content according to your reading preferences has also been enhanced. We’ve taken the reader view settings up a notch and improved accessibility by adding a reader mode button to the address bar. Cut out the clutter and bring focus back to the words. Vivaldi now includes a first for web browsers. We’re giving users the ability to go beyond the browser and into the smart home by integrating with Hue color lights from Philips. After enabling Hue in Vivaldi Theme Settings, a tap on the Philip Hue Bridge confirms the connection. Selecting which lights Vivaldi should control, the browser will synchronize your physical surroundings with the color of the web. This opens the door to a thrilling direction. We’re very excited to hear the unique ways that users take the leap from the browser into physical space. Update Vivaldi in an Instant! Last but not least, taking the headache out of updates is in our sights. Anyone who’s survived a not-so-fast connection understands the frustration of slow moving updates. That’s why today we’re launching Delta updates for all Vivaldi Windows users. This means that the next time you click “update”, you will only download and install parts of Vivaldi that have changed. Less bandwidth. More efficient. Delta is the omega of updating. As always, we’d love to hear what you think. Drop us a line in the comments.